Welcome back! That glass of wine made for such a fun way to kick off Year Three (scary, too; in some ways it was a bit like handing the wedding mic to Uncle Joe – you know who I mean – for a toast). Remember not to get too comfy, as fun new challenges wait in the wings here at ol’ FF. First, of course, TOMORROW IS FLASHVERSARY results day, with loads of prizes flung in every which direction, including the first-ever Readers’ Choice award based on YOUR votes. This Friday’s regular contest will be judged by Dragon Captains Tamara Shoemaker and Mark King. If that doesn’t stoke your competitive edge and fire up your imagination, I don’t know what will. J: Judging the entries this week was quite a treat. So many of you chose to not focus on the glass of wine instead weaving it into a much larger tale that captivated and held my attention throughout this weekend. I adored the way that many of you thought not only outside the box, but outside of the entire continent. We were treated to tales of quiet betrayal, heartache and loss that sent me wheeling with imagery. For that, I think you all deserve a round of applause! IR: So, first week and we found ourselves taken aback by the scale, ingenuity, bravado and talent of the Flash! Friday community. Thank you to her Dragoness for entrusting us with this task, as stepping behind the curtain has been both terrifying and exhilarating. As I’m sure you all appreciate the role of two judges, split geographically and temporally, was both a challenge and a negotiation of subjectivity. Thankfully there was little blood spilt, but it needs to be acknowledged how hard your creative submissions were to split apart. You guys are incredible and your writing is what makes Flash! Friday such a vibrant community to be part of. We both judged this blind, so when the winners are revealed it’ll be as much a surprise to us as you. So here we go. Title Nod: Mark A. King, “Judge, Dread.” Simply because anything that refers to my (IR that is) childhood hero is hard to ignore. Hinting at a Bigger Picture: Anthony Marchese, “The Northern Border.” Loved the concept of a conflict called the Schism Wars … here’s hoping we find out more about this place in the near future. Pulling at the Heart Strings: MT Decker, “With an Empty Cup and an Open Heart.” For making me begin to write the IR offspring sage, albeit bad, advice. D.B. Foy, “A Man Looks At His Life.” There was just something about this piece that completely captivated me. Maybe it was the personification of the alcohol woven throughout the piece or maybe it was the way that from the narrator’s first sip it became everything and anything he needed it to be. All in all, this was a brilliant use of the prompt and stunningly original. Like Alice I tumbled down this particular rabbit hole, plummeting faster and faster as our cursed narrator reflected on his constant companion. The piece took us down the theme of alcoholism and the function as part of what we are, never apologising, but stripping back layers of a love affair that had stood the test of time. Margaret Locke, “And They Lived…” I’m not usually one for clichés but these were all tied in so well with narrator’s misery that I couldn’t help but enjoy it. The ending is one that will stay with me for quite a while so it deserved an honourable mention. A playful lament to the resentment of time and unfulfilled dreams resonated due to that final image of a woman who believed herself as fragile and empty as the glass she held in celebration. Erin McCabe, “Homesick.” If I had to choose a favourite piece that fully captured the essence of a complete story in just a few words, this would have been it. The quiet melancholy that this entry carried made my heart hurt and the ending pretty had it shattering into tiny pieces. This is such a brilliant tale that it would be a dishonour not to at least mention it. I really enjoyed this piece too, the delightful playfulness of the opening that then takes us meandering through London. The tourist gaze of our narrator deconstructing a reality that reflects their own sense of self. Culminating with that perfect note of an ending. Tamara Shoemaker, “Solitary.” The loneliness of this piece is what captured me from the start. The fact that the narrator delves into this fantasy world made up of possible interactions makes the loneliness all the more felt and the way that the fantasies suddenly vanished leaving the narrator with that single wineglass as evidence of how solitary an existence he/she is leading makes the piece all the more potent. The solitude of excess and the devotion of the acolyte to their saviour, were something that lingered long after I had read this piece. The sadness and resignation, acceptance and contentment that permeates what seems such a simple tale is atmospheric – laced with the absolute mundanity of our existence (Campbell’s soup and golf). Michael Seese, “The Betrayal.” Revenge will always be one of my favourite tropes and the author captured the very essence of it here. I love the little insight into Tom’s mind and the way that he figured out what had happened but above all I enjoyed the quietness of his vengeance. The tale approaches the matter in such a cold and calculated manner that it leaves you satisfied and horrified at the end. A sublime piece overall and I think this one will linger in my mind for a while. Like many tales this week, including our winner, the notion of poison and deception were recurring tropes this week. The coldness that Jodi notes takes us delicately in hand leading us gently towards the fatal closure. In particular the line “an incarcerated man, like a glass of Cabernet, longs only to breathe.’ Will be one I will treasure for a long time to come. Matt Lashley, “Internet Dating.” I must admit that this was a personal favourite of mine. The author managed to paint a vulnerable picture of the woman that had me feeling sympathetic not only for her dating choices but also for the way that she saw herself in this detached manner that suggested a number of not so nice things about her self-esteem. The only odd thing that I picked up on was the mention of the hammer and the reason for its presence was such a brilliant twist that I have to applaud the author’s ingenuity. Like Jodi, for me this piece just worked and easily could have taken winner’s status. The title was a delight, setting the tone and also forcing the reader into a perspective that is eventually subverted. The reflective quality of the first paragraph, the visceral imagery of our narrator’s body, the disgust and delusion, was note perfect. The ending as brutal as the mind we meander within. The brilliance of this entry starts with the title along with the first sentence of the piece. It captures the reader’s attention and lends to the overall distortion woven throughout the words and that skewed perception makes the betrayal all the more felt. Because just like the narrator, the reader’s understanding of what is happening is, in the end, also distorted. Brilliant writing and an overall astounding piece. Like a trip-hop journey through sensations and emotions the tale weaves the reader back and forth through a rich tapestry of seemingly perfection into a realm of betrayal. The imagery and pace of the piece, at points nearly hypnotic moved us beyond the simple notion of a glass and into a realm of deceit and desire. Congratulations, Tamara! Below is your second winner’s badge for the wall(s) of your choosing. Here is your updated and sparklier than ever winner’s page and your winning tale on the winners’ wall. Please contact me here asap so I can interview you for Wednesday’s #SixtySeconds feature. And now, here is your winning story! Flash! Friday # 40 — WINNERS! Oh, I was giddy, yes, I was, to see what you all would do with the bridge and its passenger. Echoes of Terabithia, I thought, or perhaps Lothlorien, or Kwai. And you, clever writers, did all those things, but as ever, you also seized the prompt by its corners and reimagined beyond it. Worlds of wonder, you created. And worlds of horror and tragedy and courage and resilience. Yes! It was without question another week of phenomenal writing. Thank you so much for coming out and for supporting each other. It’s like having a massive family reunion (complete with the freaky but lovable uncle) each Friday, and I can’t imagine a week without y’all! Thank you! It’s too late for me to manage a Flash Points this week (sorry! 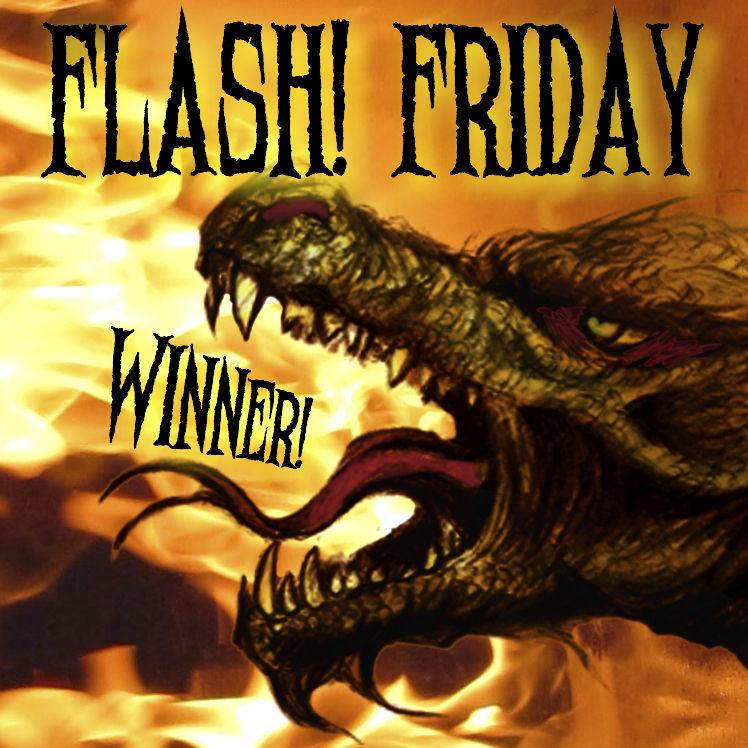 ), but remember you can always take a gander at the other flash contests going on around the flash world here. Always something going on, so get writing! Judge Anthony Marchese says, This week’s prompt was amazingly versatile, with the bridge serving as a passage to fantastic places. It was the start to one journey or the end of another. It became a thing of legend or a stage for epic conflict. I cross bridges every day, but I don’t think I’ll be able to look at them the same way again. I certainly won’t be taking them for granted. And now for your results!! Comments by Anthony & the Flash! Friday team (because the Flash! Friday team loved these bridgy stories too much to resist chiming in). Marie McKay, Untitled. Loved this reality-show type surveillance of eerie sounds affecting children across the globe. Jake Kuyser, “Liathara of Woodley.” Creative story starring a selfless character who becomes a dragon’s apprentice–great take. Nick Johns, “A Walk on the Wild Side.” A horrifying post-apocalyptic world featuring a strong-hearted girl who will do anything to get her siblings through it. That’s the kind of sister you want. Steph B, “372 Planks.” The descriptions really brought this story to life for me. Told in the simple and innocent voice of a child, the story’s underlying tone of mystery and horror were only accentuated by the child’s perfectly detailed colors and numbers. And what an ending! Brian J. Hunt, “Bridge Over the River Lethe.” Many people responded to this story, me among them. The mythology behind this intimate portrayal of a mother and son’s last moments was beautifully and artfully executed. I wish we could all throw cancer off a bridge like his mother did. While most stories focused on the girl, this story swapped lenses and instead brought to life the mysterious, architecturally wondrous world of bridges. Expressed in a story reading as personally and wistfully as a journal entry, this piece perfectly encapsulates bridges’ essence. 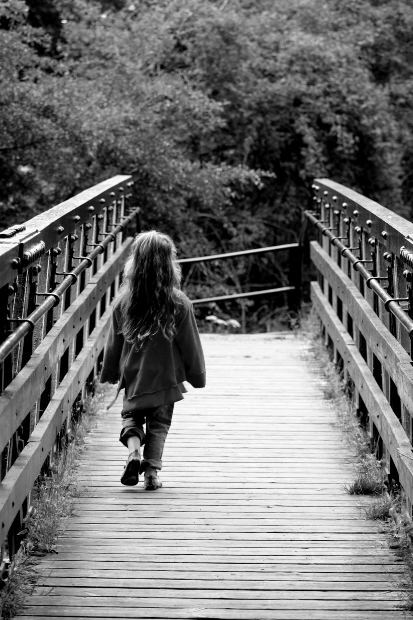 Bridges, we’re reminded, aren’t confined to serving as means to an end: they can also be the end. They enchant, fire the imagination, and even sweep near danger while still keeping the wanderer safe. Amy’s story, like the bridges she describes, poetically spans both mountains and chasms and enables us all to feel, if only for a moment, we too are flying. What a beautiful and memorable story. Great job. Congratulations, Amy! Here are your Winner’s Page, a glorious dragon eBadge (below), and your winning Tale. Please contact me asap (here) with your email address so I can interview you for Wednesday’s Sixty Seconds feature. I loved the slight pounding of my heart as I crossed over a raging river. My eyes couldn’t move fast enough to watch the cars if it spanned a busy road. Steep rocky gorges, peaceful mountain streams– they all passed beneath my feet and I felt like I was flying. CLOSED!!!!!!!!!!! “And not a minute too soon,” says the girl, flashing me one of those looks, the kind that, if she were sixteen instead of six, would have earned her a week-long grounding. We sure put her through the wringer today, poor thing, and she has just informed me that if it is quite all right with me, she is going to bed now, and I had better have something good waiting for her at breakfast. –Judge’s results Sunday! Welcome to Flash! Friday # 40. Where last week we had a prompt bursting off the page with vibrant, surrealist detail, this week we’re swinging to the opposite side of things by going almost completely minimalist. Instead of battling the wild, fantastical elements and attempting to corral them into a single tale, this time the task is to coax a story out of understated quiet. Both challenges require patient, imaginative skill, which you all have proved over and over you have in abundance. Come, write us a story! The world (and your judge) await. This week’s contest is judged by SVW member Anthony Marchese who spends much of his time on the stage dramatically quoting lines at people. Be sure to check out his judge page to find out what he looks for in a winning entry. Short version: it’s all about character development and world-building. * Word limit: 300 word story (5-word leeway) based on the photo prompt. * How: Post your story here in the comments. Include your word count (295 – 305 words, exclusive of title) and Twitter handle if you’ve got one. * Prize: A memorable yet simple e-trophy e-dragon e-badge, a stunningly clean-lined winner’s page here at FF, a stupendously straightforward 60-second interview feature next Wednesday, and YOUR NAME in twinkling lights of inspiration across the shadows of the world (so to speak). NOTE: Winning and non-winning stories alike remain eligible for selection for Monday’s occasional Flash Points.